Home of master shipwright John E. Swain. Timeless elegance, crafted to order. Boatbuilding and repair in Connecticut. Beta Marine delivers engines with a broad range of options to fit the needs of your new boat design. Here is a list of common engines we provide a superior replacement for. Beta Marine diesel engines are smaller, quieter, with less vibration and more power, and your customers will love the ease of maintenance and the low cost of replacement parts. 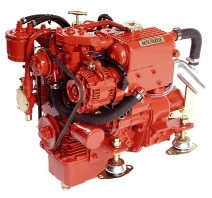 All Beta Marine Diesel engines are power rated at continuous rather than peak RPM. Most older engines were rated at peak RPM, providing false sense of more power than you really had. Give us a call and tell us about your boat and we will prepare a quote for an engine that will be quieter, more fuel efficient, more compact, and weigh less. Our toll free number is 888-792-BETA (2382).